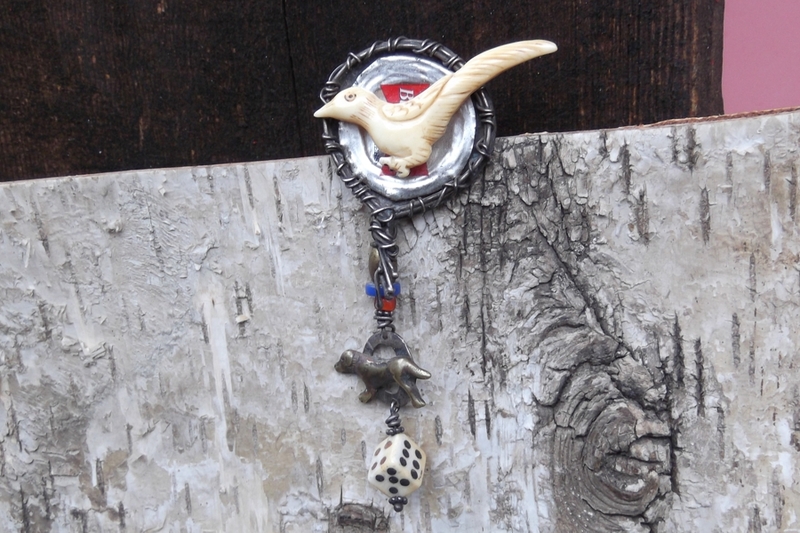 From the eclectic designs of Sweet Bird Studios, we offer you a one-of-a-kind art brooch. 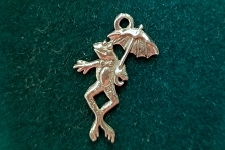 At the center of Sweet Bird Studios is Nancy Anderson, a multi-talented artist and jeweler. Her designs are "irreverent, whimsical, often ironic and sometimes bittersweet. Found objects and recycled pieces are the elements of her soul, which carries over into her artwork. We found this unconventional pin, typical of her work, at an estate sale and were taken aback by the keen sense of style and workmanship. The piece is signed by hand on the back and dated ©02. There is also a number of some sort, but we can't decipher it. Ms Anderson calls her art "wearable shrines of intention." And that this is. The center is created from a pounded Budweiser bottle cap. But, don't be fast to dismiss this as the simple (yet elegant) bottle cap jewelry. In fact, the outside of the bottle cap is the center of the piece. The base is backed by antiqued bronze and wrapped with abandon around the tin cap. 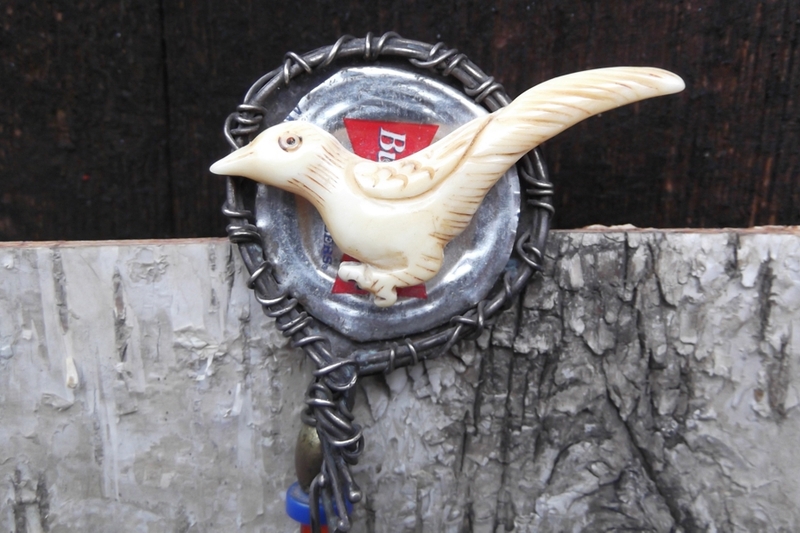 Proudly flying on to the base is an extraordinary aged bone bird with glorious wings and tail feathers. It doesn't end there. 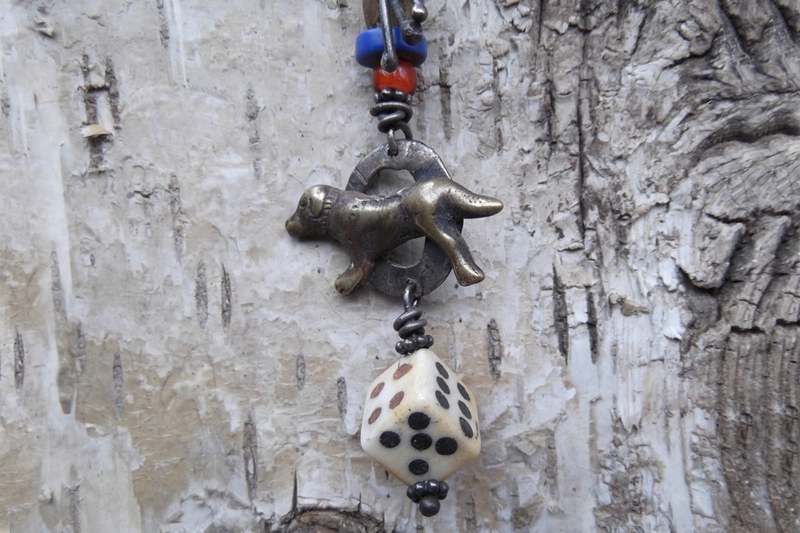 From the central section, there are a melange of beads and charms including a dog on a pounded oval and a little bone die. There are so many details, we are at a loss to describe this individual artful icon. The entire piece measures approximately 4 inches long. The bird is the widest component at 2 inches. We are imagining such fun worn on a denim or linen jacket or the like.